Treasure Island...was treasure buried there? No one really can answer that question for sure but Done Rite Party Rentals has a bevy of treasures just waiting for you to discover right now. Just a phone call from you to our company will reveal our trove of bounce houses and inflatable water slides just itching to be put to work. Birthday parties and all things festive become the talk of Treasure Island when Done Rite Party Rentals dot the party scene. In 1985 a sand sculptor named Todd Vander Pluym was commissioned by the chamber of commerce in Treasure Island to build a world record sand castle. Pluym did just that with a crew of helpers and thus Bluebeard’s Castle was created. The sculpture stood 37 feet high. Done rite Party Rentals can’t boast of any sand castles in our collection but, then again, a sand castle won’t withstand a bunch of children jumping and bouncing on it. Our inflatable bounce castles are sturdy and meant to be used for such activities and, best of all, they are fun! Our treasure trove of party rentals consists of: bounce houses and castles, water slides and moonwalks for the city of Treasure Island in Pinellas County. 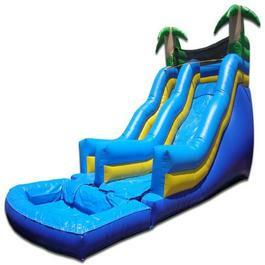 We have a vast selection of styles and themes for our inflatable bouncers and slides. 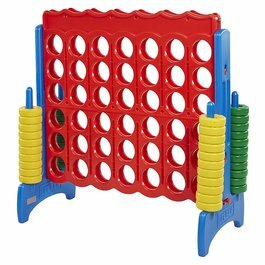 Donerite Party Rentals also offers an assortment of interactive games to compliment our popular bounce rides. For a refreshing treat, rent one of our snow cone machines. For popcorn lovers, we have a machine for that too. 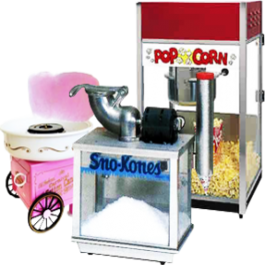 If you want to experience that old time carnival feel, rent one of our cotton candy machines. 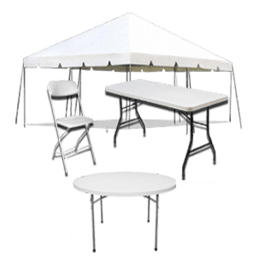 Done Rite Party rentals offer extras, such as tables, chairs and even tents. Our party bounce houses and water slides are not limited to birthday parties in Treasure Island. Any special occasion or even a play date is a perfect reason to pull out all the stops and rent one or more of our inflatable bounce rides or water chutes. Done Rite Party rentals can be enjoyed by adults as well as the kiddies. Our larger size bounce houses have enough room for a grownup to fit inside and keep an eye on the kids. Our water slides come in sizes from small to large. When you rent our inflatable party attractions, our Done Rite party staff will deliver, set up and remove all bounce houses and water chutes. All you have to do is show up with your guests. Our set up crew will make sure to have bounce houses and all other inflatable party gear in place before the festivities begin. 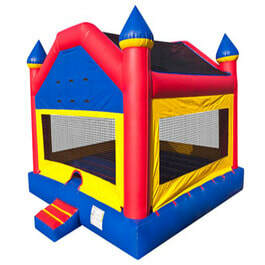 Our party rental company can use different venues to put up our bounce houses and party extras. Backyards vary in size and often are too small to fit more than one bounce castle (or even one, for that matter) so you name the location...a park, eg. and we will “bounce” right to it! Done Rite Party inflatables are inspected regularly to avoid defects. We clean and sanitize each bounce unit before and after each use. We are licensed and insured and follow the codes of the city of Treasure Island.